Players age 6 compete. Players hit off of a pitching machine fed by one of the umpires or coaches during the game. All players play the field on defense for each team. Each team typically plays the other teams twice, once as the home team and once as the away team. The top teams compete in a best of three 6 Yr Old League World Series. Peanut League Players ages 7 & 8 compete. Players hit off of a pitching machine fed by one of the umpires or coaches during the game. Ten defensive players play at a time for each team (4 outfielders) and each player plays a minimum of 2 innings in the field. All children in this division bat in the line up. Each team typically plays the other teams twice, once as the home team and once as the away team. 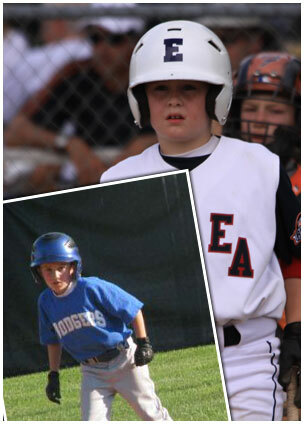 The top two teams compete in a best of three Peanut League World Series. Players ages 9 & 10 compete. This is the first EABC age group where team members pitch. Ten defensive players play at a time for each team (4 outfielders) and each player plays a minimum of 2 innings in the field with 1 at bat. Four outfielders are used instead of three to allow more playing time for everyone. Each team typically plays the other teams twice, once as the home team and once as the away team. The top two teams compete in a best of three Minor League World Series. Players ages 11 & 12 compete. Team members pitch. Nine defensive players play at a time for each team and each player plays a minimum of 2 innings in the field with 1 at bat. Each team typically plays the other teams twice, once as the home team and once as the away team. The top two teams compete in a best of three Major League World Series.